Using More Picture-Perfect Science Lessons: Using Children’s Books to Guide Inquiry, K-4 in your classroom is easier than ever! NSTA’s ClassPacks, each sufficient for a class of 28 students, are lesson-specific collections of materials—an unmatched time-saver and a great deal. This ClassPack for the book chapter “That Magnetic Dog” in More Picture-Perfect Science Lessons: Using Children’s Books to Guide Inquiry, K-4 includes 7 magnetic wands, 1 roll white cotton string, 7 white 9- x 12-in. Styrofoam dissection trays, 1 pencil, 1 box small trash bags, 1 roll aluminum foil, 7 metal spoons, 1 small bag cotton balls, 7 jingle bells, 7 metal washers, 7 iron nails, 7 steel wool pads, 7 plastic spoons, 7 split rings, 8 nickels, 8 marbles, 8 paper clips, 8 keys, and 8 pennies. Using More Picture-Perfect Science Lessons in your classroom is easier than ever! NSTA’s ClassPacks, each sufficient for a class of 28 students, are lesson-specific collections of materials—an unmatched time-saver and a great deal. 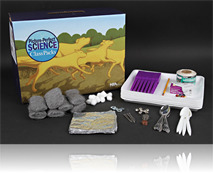 This set includes all of the ClassPacks for More Picture-Perfect Science Lessons.